Chronic Inflammatory Diseases are a major health issue without satisfactory treatment despite decades of research. 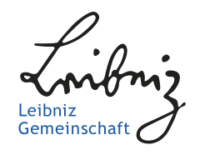 In this lecture series, postdoctoral researchers associated with the Leibniz WissenschaftsCampus Berlin, will present their research areas and perspectives spanning state-of-the-art experimental methods, cellular mechanisms of chronic inflammation, novel therapeutic approaches and drug discovery. The aim is to share experiences, ideas and concepts thereby increasing interest in the complex field of chronic inflammatory diseases among advanced Master’s students and PhD students in all related subjects. In this lecture series, our PostDoc Fellows will present their research areas and perspectives spanning state-of-the-art experimental methods, cellular mechanisms of chronic inflammation, novel therapeutic approaches and drug discovery. The aim is to share experiences, ideas and concepts thereby increasing interest in the complex field of chronic inflammatory diseases among advanced Master’s students and PhD students in all related subject. Techniques such as next generation sequencing, RNAseq, health services research, Therapeutic Concepts of Chronic Inflammation as well as sites and cells of chronic inflammation will be discussed.